Koalas have a bad rap. The warden of the preserve here says “real” koalas are miserable and would make lousy pets. Well I’d rather not be a pet anyway. Does this mean ALL koalas are likely slahser sociopaths? 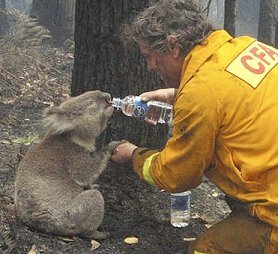 If that were true, then you wouldn’t have images like this, taken from a news article about a survivor of an Australian wildfire. Her name is Sam and please notice she is NOT shredding Dave, the firefighter. The video is available here. Now THAT’s more like it. Balanced Koala coverage.